It’s time to ring in the summer!! 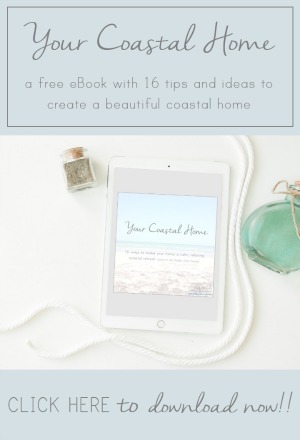 What better way to do so than by taking a little virtual trip to some beautiful waterside homes?! 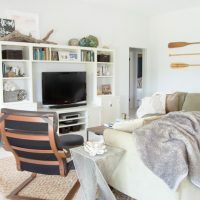 I’ve rounded up 15 crazy talented home bloggers who live on or near a beach, a lake, or a river and asked them to open their homes this week and share how their home style is influenced and inspired by those nearby waters. Today, Wednesday, and Friday be sure to hop around and visit everyone’s tours for a little vacay of your own! First, for my tour, a little introduction. I’m Emily and I live on the lower Texas coast with my husband Matthew and a sassy little feline named Lily. Matt grew up on the coast and while I didn’t, we did head down to my family’s beach cabin every summer (still try to), so we both have had the ocean in our soul from a VERY young age. 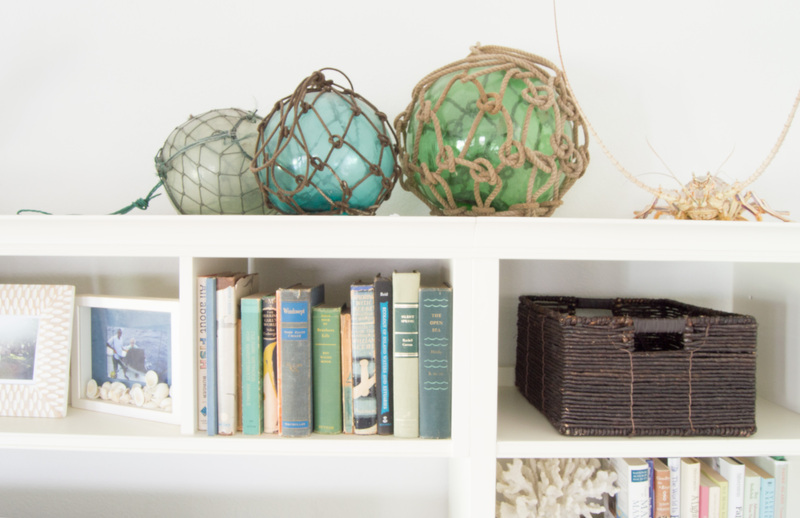 We bought our first home about seven years ago and have slowly been updating it ever since to give it more personality and to make it work with our relaxed coastal style. I’ve always loved decorating and crafting but in updating the house, I started teaching myself how to DIY too and now love taking on projects and learning new techniques and tools. So, let’s start the tour shall we?? 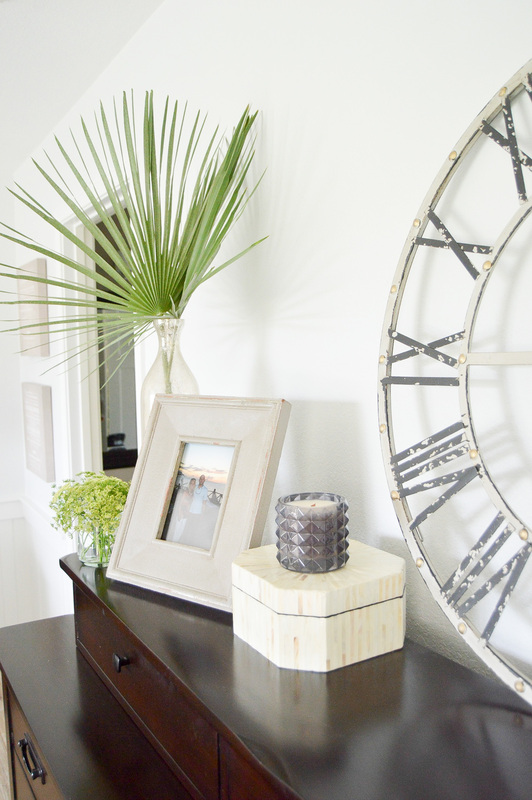 Our home’s living spaces are two large connected areas so to fashion a “foyer” off of the living room, I set up this console table and mirror near the front door where we can set things as needed. 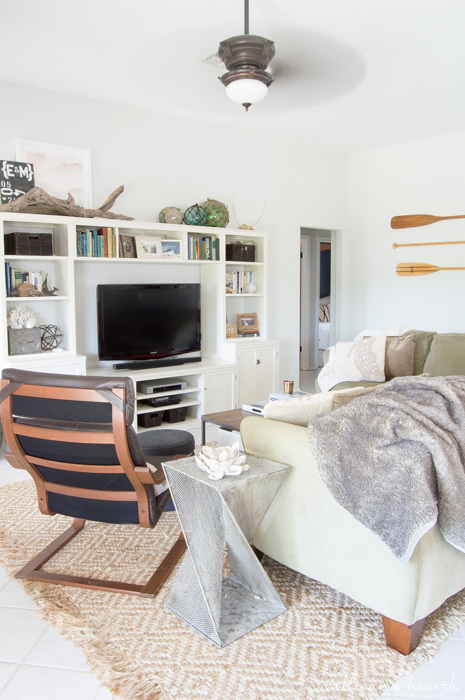 Our living room is very open but we have made it feel much more warm and intimate with a large entertainment center and fun wall decor to take up those big walls. 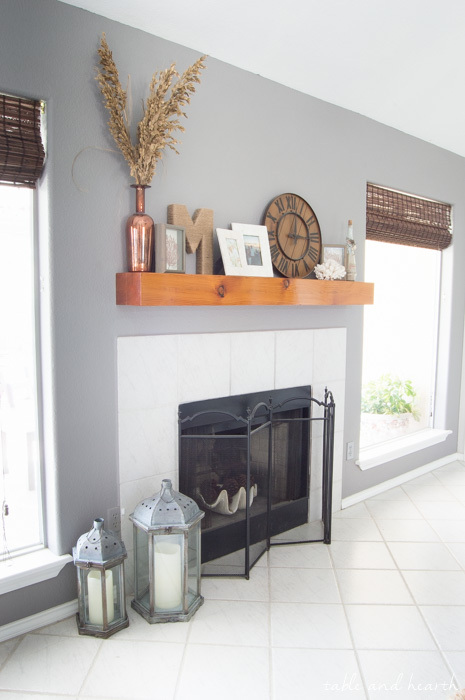 We also have one wall with a fireplace in the living room. 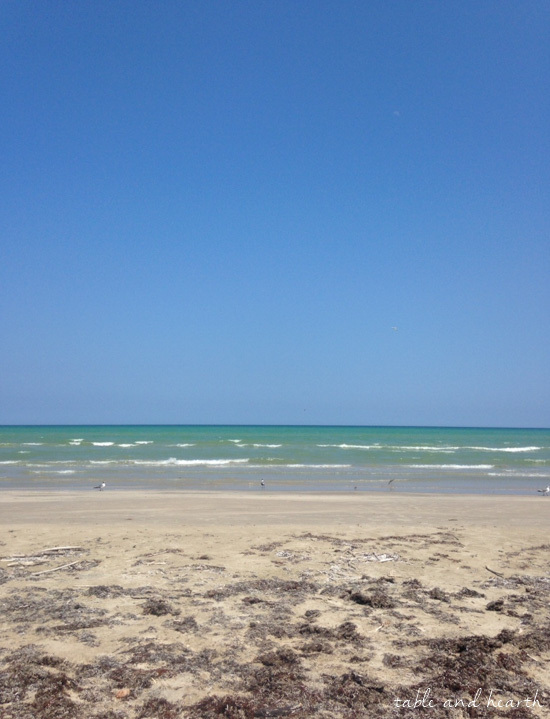 Now, being south Texas, we NEVER use it but I do love to have a focal point in here and am happy to decorate a mantel. It is flanked by these huge solid windows which let in a ton of light and look out over our pretty backyard. 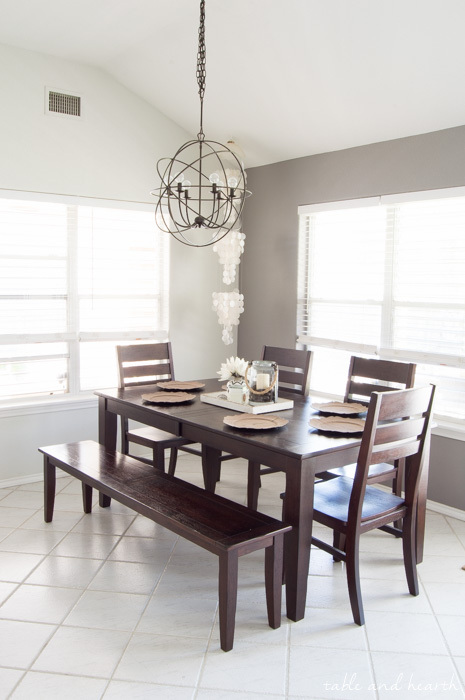 Our dining area is also surrounded by more windows and high ceilings. I’m not a huge fan of a ton of tablescaping unless it’s an occasion so our set is simple and clean. 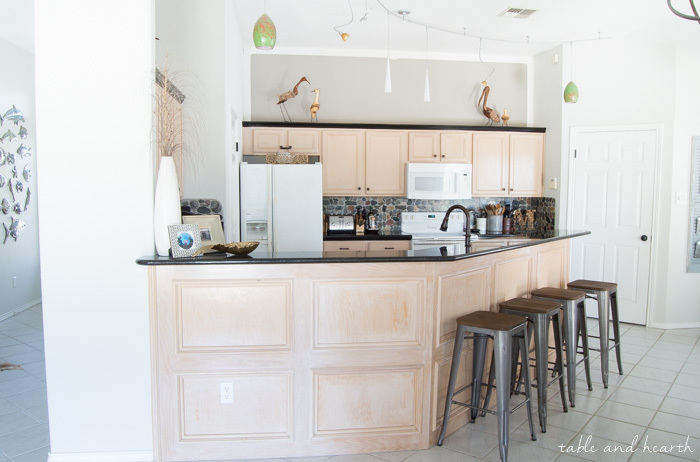 Our kitchen and breakfast nook are also nice big open areas, but the kitchen needed some updating (ugh, pickled oak cabinets!). If you’ve been around recently you’ve heard that I am in the middle of doing just that. 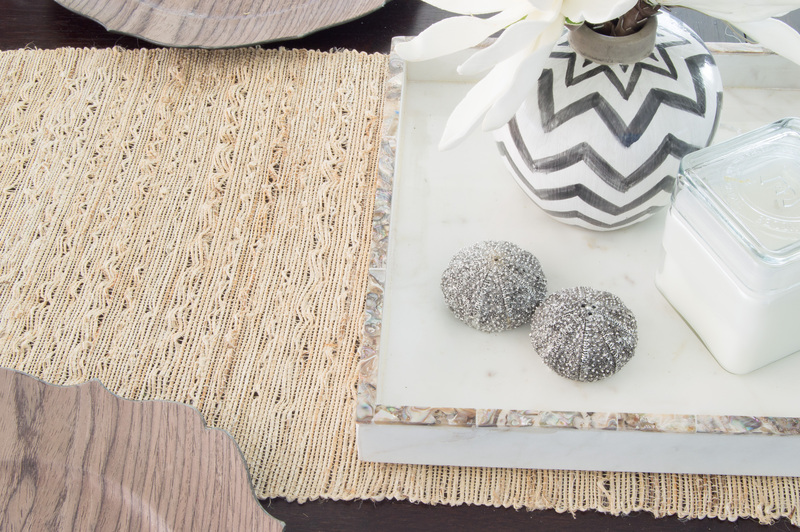 You can catch up with the series here, so stay tuned for a MUCH prettier kitchen in a few weeks! 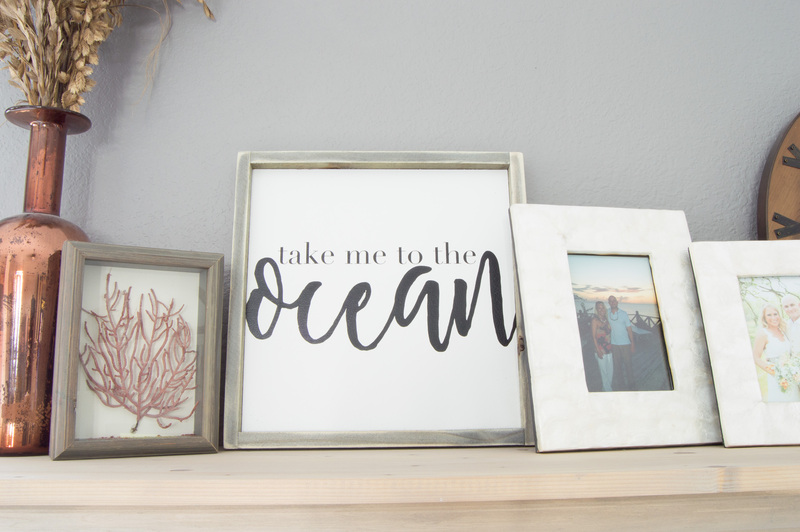 Given our locale, it’s pretty often that we’ve got family or friends coming to visit for a weekend at the beach so I wanted our guest room to feel like a relaxing beach cottage escape. 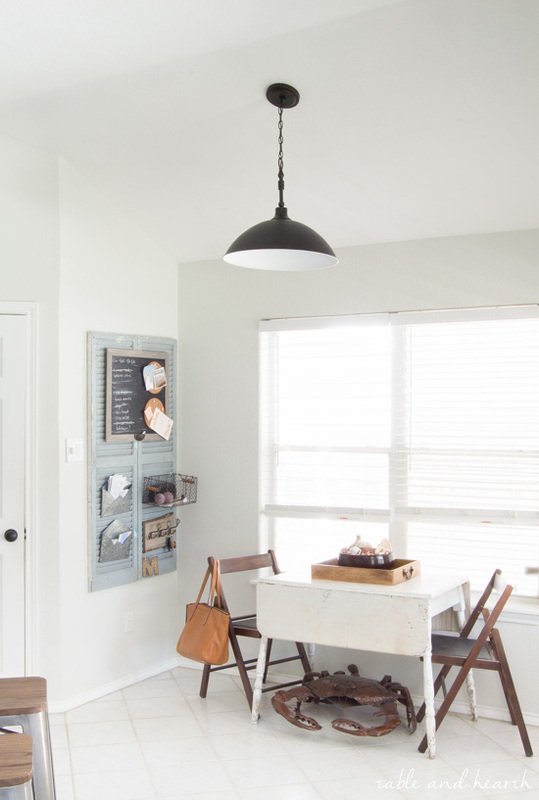 It got a ton of updates, including our pretty dark shiplap wall. 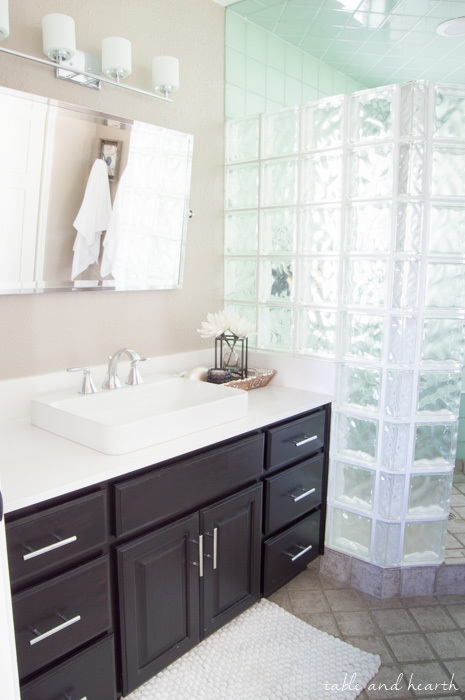 Our guests also get pampered in the updated guest bathroom. This space is what triggered my love of DIY and is still something I’m super proud of. Even though we love neutral, light, weathered tones, I’ve always had a major design crush on dark walls so I thought our office would be a fun space to try it out. 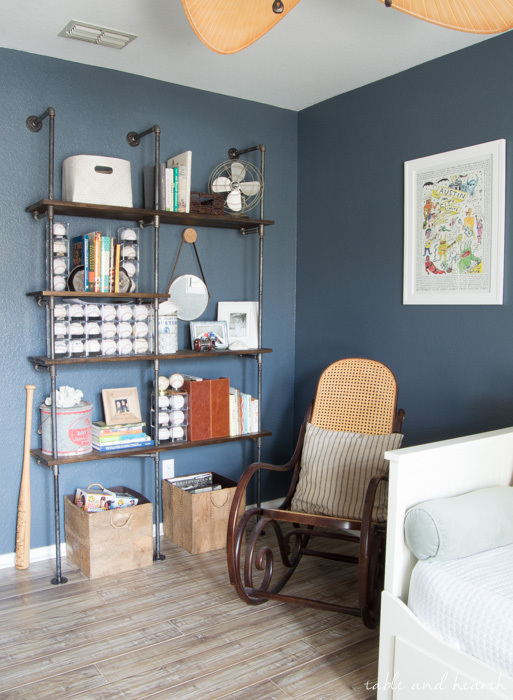 I found the perfect color and have made this room into a special place to show off some of our fun stuff and be a little bit funky while still being light and airy. Our master bedroom is SUCH a retreat for us and has come a loooong way in seven years. 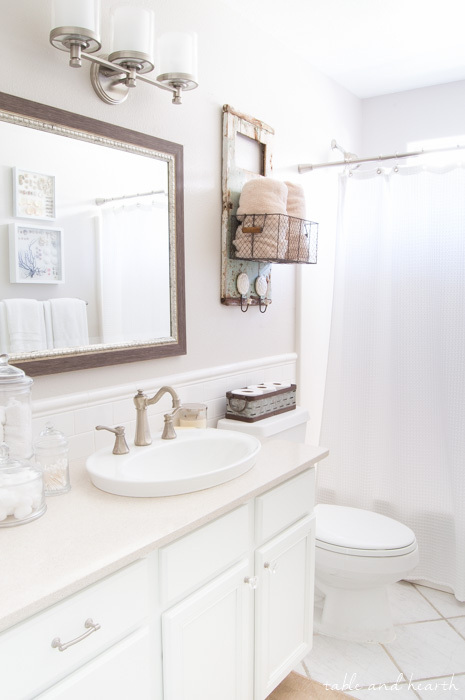 The wainscoting makes it elegant but the patterns, colors, and finishes are very coastal-inspired. 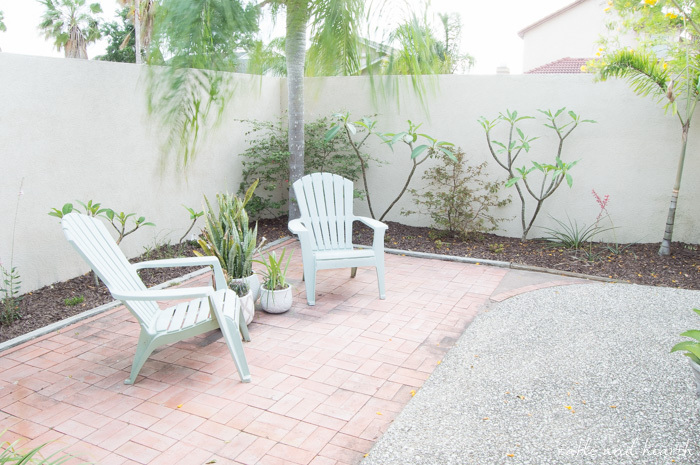 Finally, is our newly redecorated patio and backyard. 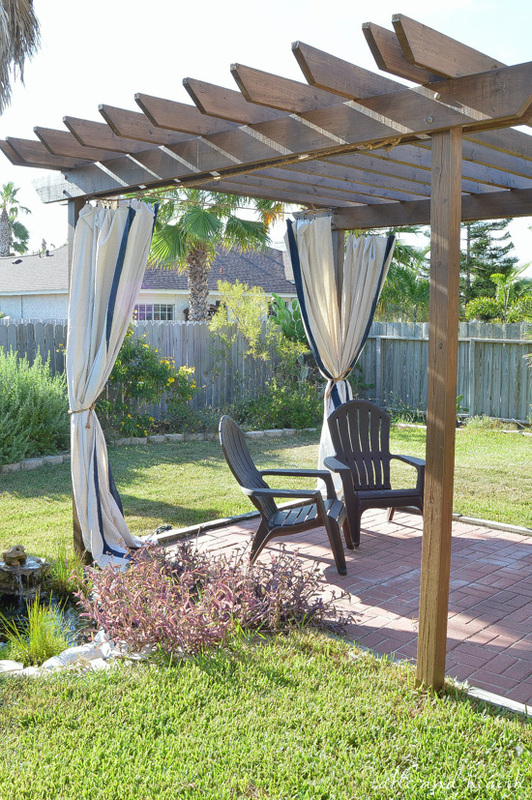 We LOVE our backyard and have put a ton of work into it over the years. Welp, that’s it y’all, our cozy little home by the sea. 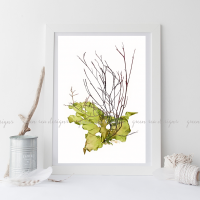 I hope you love it and thanks so much for stopping by to check it out! 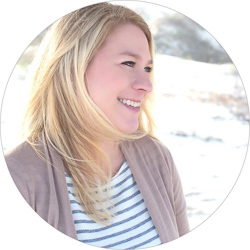 Now head over to The Happy Housie to see her beautiful lake house!! SO beautiful! I love how relaxing your house is. Looking forward to visiting some of the other homes on the tour, too. Pinned! Your house is so pretty, Emily! 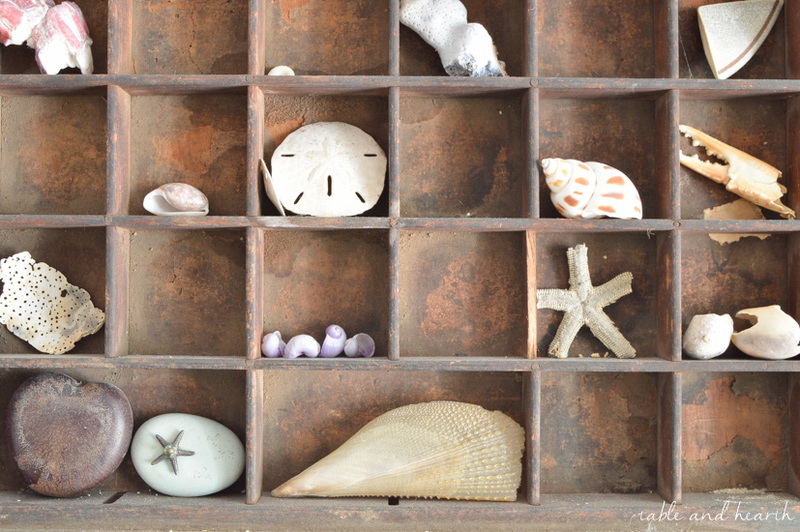 It has such a cool, coastal vibe and I really love all the natural elements. So much inspiration! 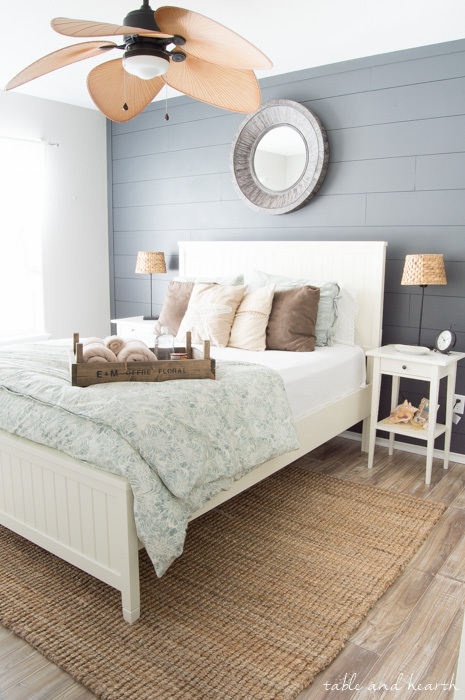 Love that dark shiplap wall so much! Hi Emily, I love the guest room. Where is the comforter from? Thanks Christine! It is from Pottery Barn a few years ago, and while it doesn’t look like it’s still there there are a few that may be similar. So beautiful Emily! I love every inch of your home! Aw, thanks so much Sarah!!! Thank you Janet! Looking forward to seeing yours on Friday!! I just love your home, style and creativity. 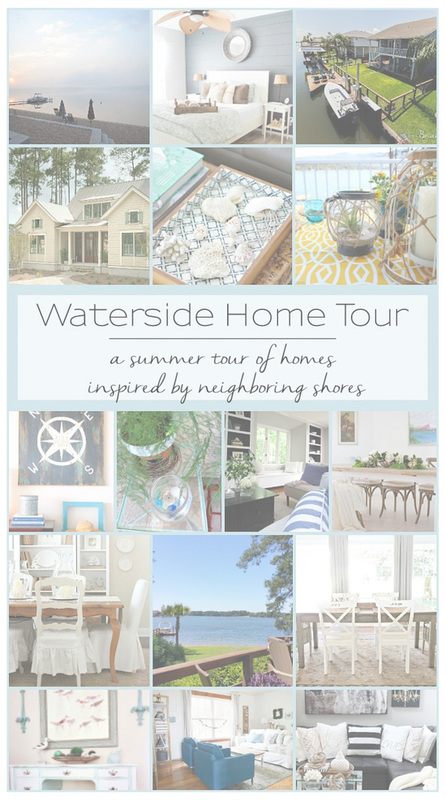 Thanks for the Summer Waterside Home Tour. I am learning so much. Thanks so much Meegan!! I can’t wait to see all the other homes this week! 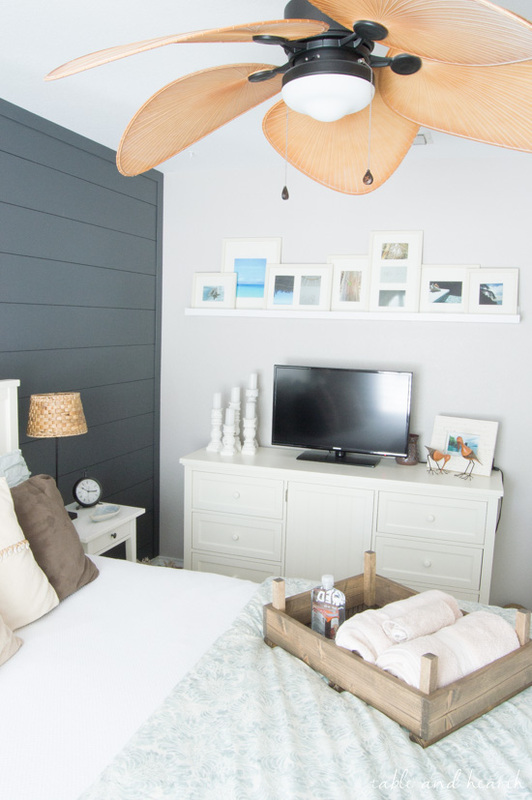 I haven’t been able to stop thinking about that dark shiplap wall all day! Seriously. I’ve thought about doing the same thing in one of the bedrooms in our house. It HAS to happen. I looooooove it! Beautiful tour, girlfriend! Dooooo ittttt!!! :) Excited to see yours tomorrow!! I love it! 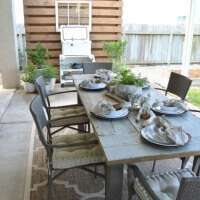 Your patio area is gorgeous and I am so jealous of your outdoor dining space. Also, I now feel like I need a dark wall somewhere in my house. :) The shiplap wall and the office walls are so pretty. 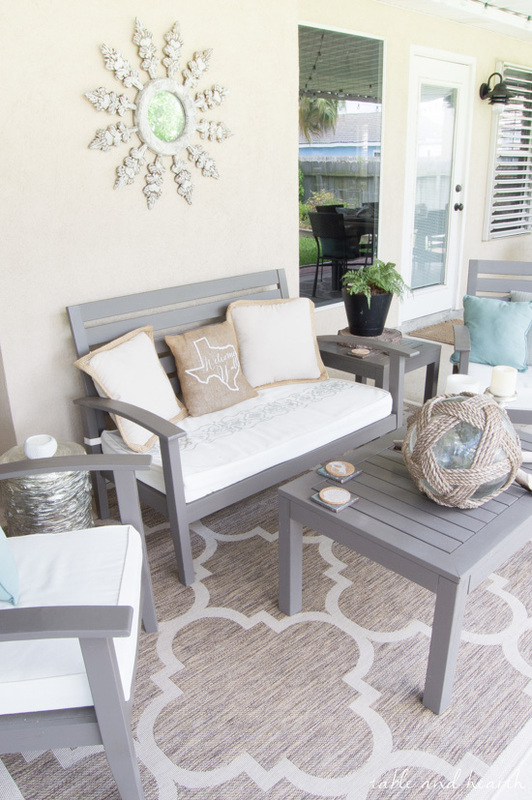 I think every home needs a little moody dark accent somewhere for sure :) And I just know you guys will soon have an amazing outdoor space on the main level soon, with definitely a better view than ours has! Thanks so much for joining in on the tour guys! Oh my gosh, so many fun details! I’m not much of a table scaper either, I love what you have on yours. And that tray on the bed? Did you make it? It’s beautiful! Oh my – where do I begin?! My favorite decorations are the glass balls and your various ceiling fans and pendant lights. 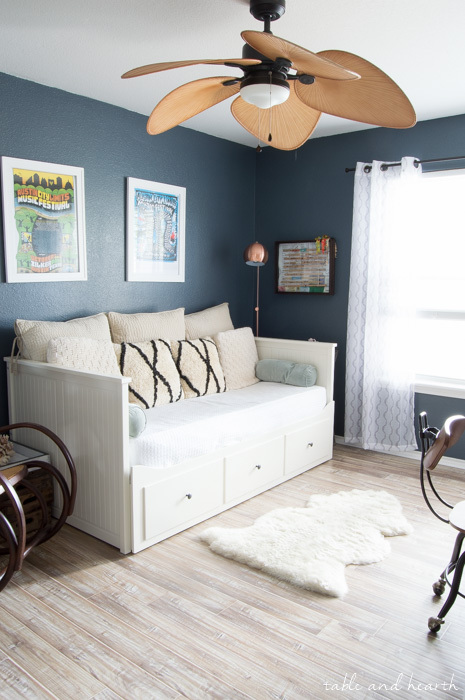 But my favorite color is blue so I love the shades you’ve incorporated in your home. So gorgeous – all of it! Emily, your home is so vibrant and beautiful, Its a pleasure to be involved with this. 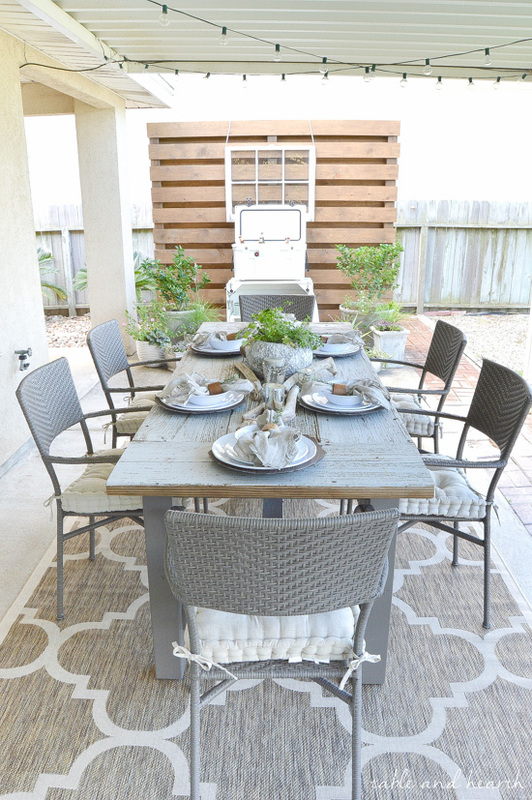 I love the outdoor rug and table, so chic. LOVE those rugs Maria!! It’s one of our favorite spaces for sure :) I’m so happy you could join in and I’m so excited to get a tour of your beautiful home on Friday!! Thanks Jen!! That kitchen may be the death of me but I know it’ll all be worth it in the end :) I’m so happy you were able to join us! I made the husband carry that crab all over a flea market, but it was totally worth it :) We love him! 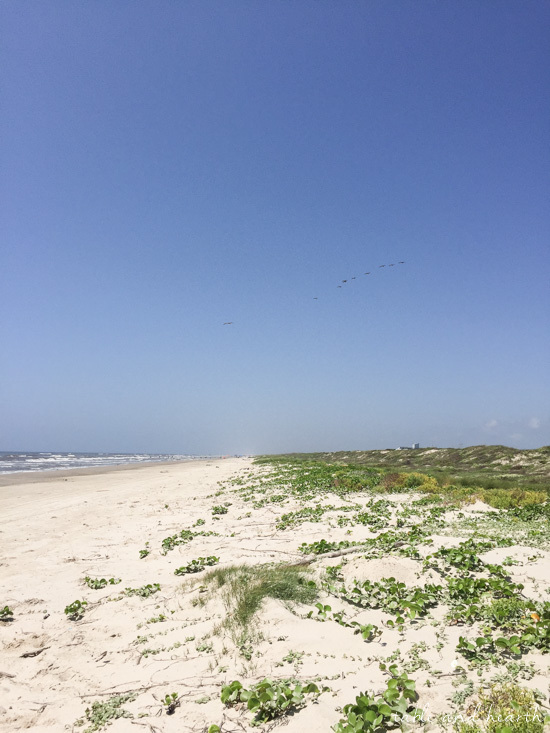 Thanks for joining us and sharing your beautiful exotic locale! What a lovely home, and I especially enjoyed your outdoor living spaces. Very inspiring! Thanks so much for the tour and all the gorgeous homes. Thanks so much Joanne!! They’ve come quite a long way (thank goodness)! So happy you love the tour, hopefully you found tons of inspiration! I have enjoyed touring all of these lovely homes! 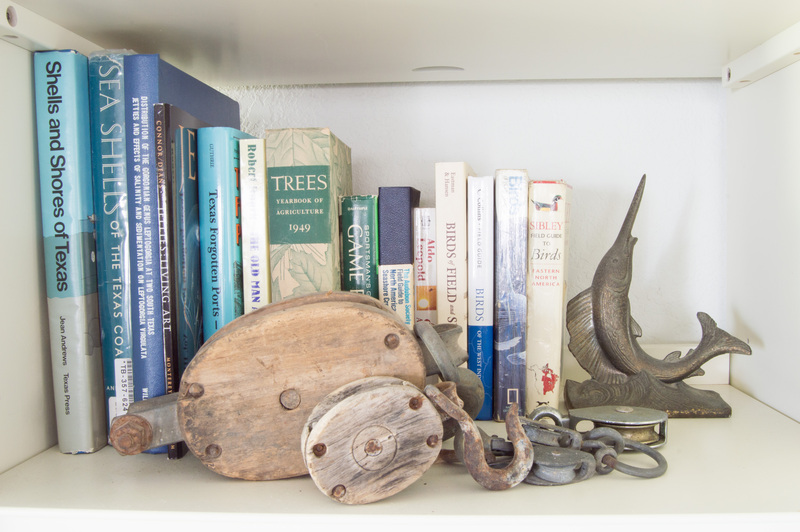 I moved into a coastal/low country style home last year, and though we are landlocked in central Florida, I have incorporated our love of sailing (in the summers on Lake Erie) and the coast in our home. I am still working on finishing the decor and have gotten some great ideas from your lovely home and all of the others on this tour. I am pinning this to my house tour board and have subscribed! 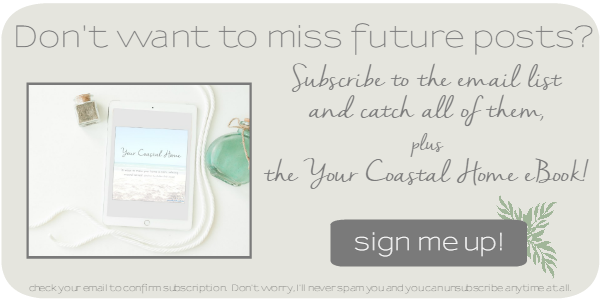 I still consider anywhere in Florida to be coastal, and your home sounds amazing. 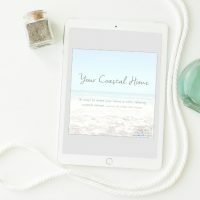 So happy you’re finding some great inspiration and some wonderful blogs to follow!! I wish it were the Caribbean outside Nina ;) Thanks so much and I’m glad you could join us!! Aw, thanks so much Krista!! 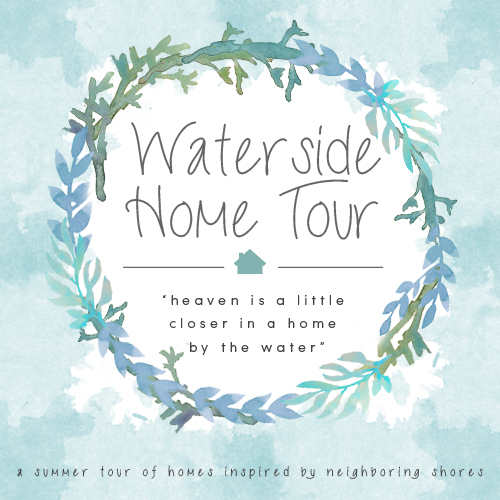 This tour was so much fun, I’m so happy you could share your gorgeous home too!